Girls in the village of Manggaru* are at risk of child marriage. ©UNICEF Indonesia/2015/Nick Baker. Fourteen-year-old Nira* was a bright student. She always worked hard and received good grades – excelling in subjects that ranged from art to science to cultural studies. But Nira’s time at school just came to an abrupt end. Because tomorrow is her wedding day. Nira lives in the village of Manggaru. It’s a small, rural community around 70km south of Jakarta. Child marriage is common in this village. In fact, Nira is the third student to leave school and get married this year. “I like to play petak umpet (hide and seek),” says Nira, when asked to describe herself. She seems resolute about the wedding. “If I wait until graduating to get married, my spouse will not be available anymore. It would be too long for the groom to wait,” she says. “Parents here think the benefit of marrying their daughters outweighs the benefit of letting them finish school. If they marry their daughter, there is less economic burden on the household,” he says. It will only be a matter of time before Pak Deni receives news of another girl leaving school to become a young bride. But for now, his female students seem to have far bigger plans. One wants to become a teacher, another wants to be a chef; businesswoman, doctor, lecturer – the list goes on. Many of these professions will require the girls to not only finish school but also to obtain a university degree. “I would go to university if we had the money,” says one girl. Unfortunately, university is a luxury that a number of families in Manggaru cannot afford. Marriage is seen as a much more financially-sound option. Some of the girls have advice for Nira. “She shouldn’t fight with her husband,” says one. “I hope she has a baby soon,” says another. The thought of a new baby in the village seems exciting. However, not one of the girls know exactly how someone falls pregnant. Giving birth in Manggaru is fraught with risk. And it is even riskier still for young girls like Nira. Healthcare options are extremely limited – the nearest doctor is almost a one hour drive away. When a woman goes into labour in the village it is much more common to visit the paraji (a traditional birth attendant). The paraji’s facilities pale in comparison to a doctor or hospital and it is common for women to suffer severe injury or even death during childbirth. As for the boys of Manggaru, the subject of marriage raises a mix of responses. “I know a girl that was just 11 when she got married,” says one boy. “A friend of mine was married at a young age. She died giving birth,” says another. Despite such dire stories, the boys admit it is “normal” for a girl like Nira to be married so young. None of them are aware of the minimum age set by the Indonesian marriage legislation. The dreams and hopes of Nira will be put on hold after tomorrow. Her future husband, Fadil, is nine years older than her. He currently doesn’t have a job. Exact plans for the couple remain unclear. But Nira insists that marrying him is the right thing to do. *Exact location and names have been altered. In Indonesia, one in six girls are married before their 18th birthday, leading to a sudden end of their childhood and perpetuating a cycle of poverty that is extended from one generation to the next. 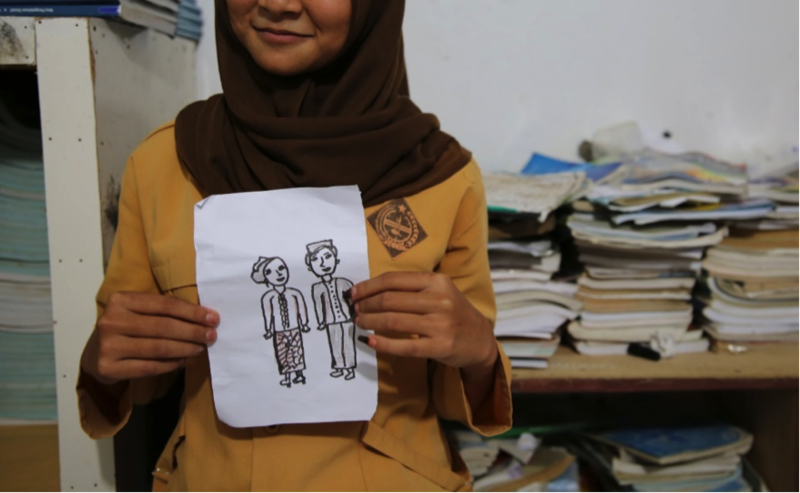 UNICEF advocates and supports a multi-pronged approach to address child marriage in Indonesia, reaching out to children and young people, their families and communities as well as to the Indonesian Government.